There is a large number of interesting questions asked of FOA! How Much Do Installers Make? 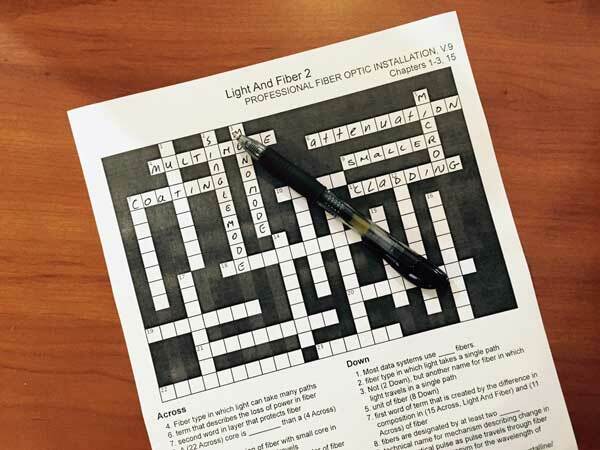 Sacramento's Golden 1 Center Claims To Be "Highest Tech Stadium In Sports"
Download the crossword puzzle on "Optoelectronics and Splicing." In July 2016, FOA certified it's 60,000th tech and more than 9,500 of those have achieved CFOS Specialist Certifications. By early September, we were already at 61,000. 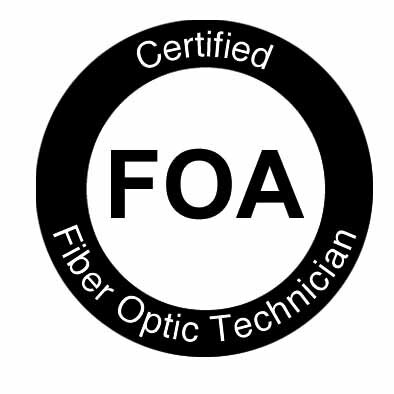 Are you experienced in fiber optics but not FOA CFOT® certified? 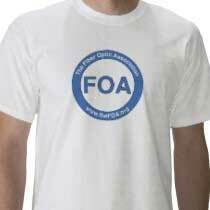 FOA's "Work To Cert" program is for you. 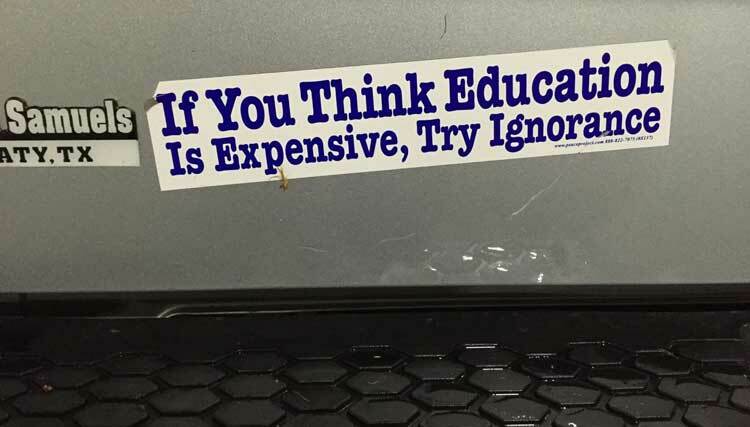 Bumper sticker on the tailgate of a contractor's pickup truck. 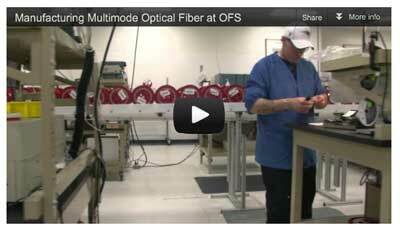 Over the last couple of years, the applications of fiber optics have been growing very rapidly. One obvious reason is the explosion of projects for fiber to the home (FTTH), but we're also seeing the same kind of growth in data centers, DAS in large pubic facilities, fiber to the antenna (FTTA), municipal fiber networks supporting education, public safety, security and intelligent transportation systems, alternative energy projects and lots more. The need is also growing for more trained workers. We've seen an acceleration in the number of students at our schools getting trained and certified. We're also seeing more experienced workers coming to FOA applying for direct certification through our "Work To Cert" program. Often it is because their customers are requiring it - many after having problems with installation projects caused by incompetent workers. These trained and certified workers are part of the success stories we hear almost daily about installation projects everywhere. 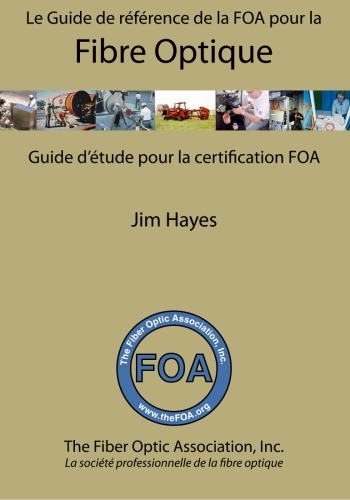 It's obvious to FOA that training/certification and success go hand-in-hand. What's obvious to FOA is obviously not obvious to everybody. Cutting the costs of employees - including training - is seen as a way to save money and create more profit, often without the understanding that poor job and/or project performance will reflect badly on the company following that business strategy. Here in the US, we have a saying for this - "being penny-wise and pound-foolish." A system that was designed with specifications that greatly exceeded user needs. Of course, it was also extremely high priced, perhaps double the price of a reasonable system. Building a system for today's needs and planning for a future upgrades when (if) needed would have been much more cost effective. Sending design projects overseas for CAD work to save money. It appears that these designs had no input from people who had physically examined the routes. The designs ignored the likelihood of other cabling in conflicting areas and local geology that could prevent economical underground construction. Even designs done locally are not being physically inspected properly by experienced contractors, causing similar problems. Contractors subcontracting to other contractors who sometimes subcontract to others, often without any control over the hiring of skilled workers. Hiring workers with little or no training at minimum wage or below, often workers without language skills to understand written or verbal directions. No OJT - on the job training of these low or no-skilled workers doing skilled work. Workers on projects having no personal identification or identification of the contracting organization. Top of the list: Digging up existing cables, often breaking fiber cables, sometimes multiple times, even on private property where they did not have permits or ask permission of the owners. Poor workmanship, especially when burying cables on streets and customer lawns, leaving a messy installation and not cleaning up afterwards angering both consumers and municipal officials. 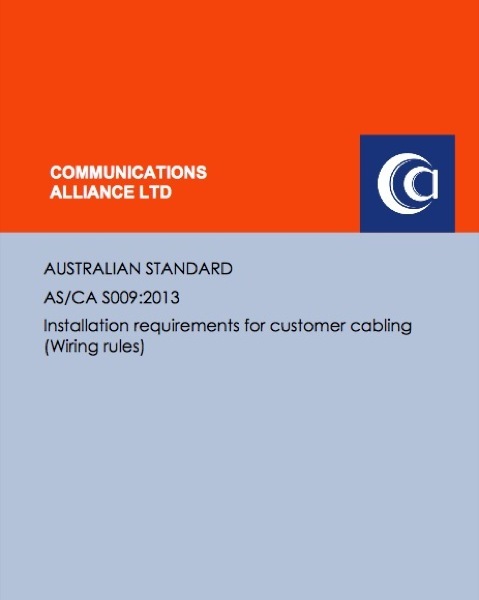 Workers installing cables without leaving adequate cable length for splicing or connections. Not knowing how deep to install underground cables. Not understanding testing methods or instruments so test results are meaningless. This often makes it impossible to judge the quality of many installations. We'd bet that the bosses making the decisions that cause these problems would never let an unlicensed electrician work on the wiring in their homes, trust their vehicles to unskilled labor for repair or let unlicensed doctors treat their families just to save money, but they seem oblivious to the downside of giving business to the lowest bidder without investigating their qualifications. Invariably, it seems, the contractor will blame the manufacturer of the products for the failures. In one case long ago that I (JH) was involved in, a supervisor for a contractor pulled out over $100,000 worth of perfectly good cable and threw it out in a muddy field in the rain because his workers told him it was all bad. The cable was perfectly good, however, but his employees were incompetent at splicing and testing. Rather than admit they were the problem, they blamed the cable manufacturer, who had to send a crew (including me) to the job site to investigate the issues with the installation. While the manufacturer was cleared of any blame, the contractor, faced with the loss of the $100,000 of cable and redoing all the installation, walked away from the job and went bankrupt, leaving the customer with nothing but a mess to clean up. If you are selling products for a project, isn't it worth your effort to ensure the installers are competent? Wouldn't you rather ask some questions in the beginning rather than have to bring out the technical experts (and maybe lawyers) later to defend your reputation? In practically every case like that, everybody loses. If you are a cable manufacturer, do you limit your warranty to the delivery of good product on the reel to the customer location and it's their problem after that? If you make fusion splicers, can you prove that bad splices are not the result of the function of your machine? Test equipment manufacturers - do you guarantee that if your tester says "Pass" when the operator pushes the "Auto Test" button, the cable plant indeed is meeting the specifications required? Wouldn't it be easier if you stated your warranty would only cover your product if installed by a properly trained and certified installer? Twenty years ago, most manufacturers had programs for "certified installers" that they had trained themselves. 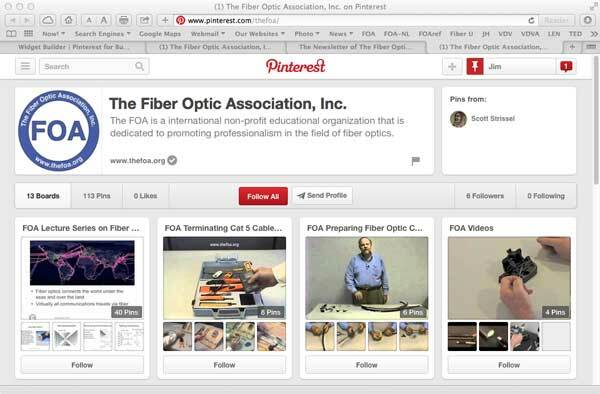 It was in reaction to the variability of those programs that the Fiber U instructors (who included several from companies that offered manufacturer certifications) decided in 1995 to start the Fiber Optic Association. 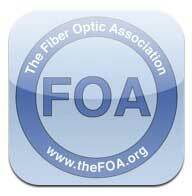 The charter of the FOA then was "to promote professionalism in fiber optics through education, certification and standards." Still is. FOA partners with the IBEW, CWA/Alliance, many companies, agencies, telecom ministries and a long list of those involved with fiber projects to ensure proper work on their projects. But that's probably still not enough. You can't train a fiber optic installer in a one-day course that covers little technical material and has little - if any - hands-on skills training. You can't have an installer take a one day course on a manufacturer's product and expect them to know the full scope of the work they will be doing in the field. A novice who takes a course and gets a certificate - or certification - is not an expert. The FOA goal is to give them enough knowledge for OJT - on the job training. That means they are ready to work in the field with an experienced tech who will mentor them - showing them what fiber installation looks like in the real world, teaching them to develop new skills and learning how to made decisions on their own about an installation. You must have newly trained employees properly supervised to help them develop into skilled technicians. Have you considered interns And apprenticeships? We need to educate the bosses, supervisors, network owners, IT managers, project managers, facilities managers, etc. - whoever manages the design and installation on a project, signs the contract and perhaps more importantly, the final checks - educate them about what's involved in a fiber project, what competencies contractors and their installers need and how to judge the finished project. We need to teach them how to develop their employees skills through training and OJT under proper supervision. Only when they understand what they are managing will these problems start becoming less widespread. 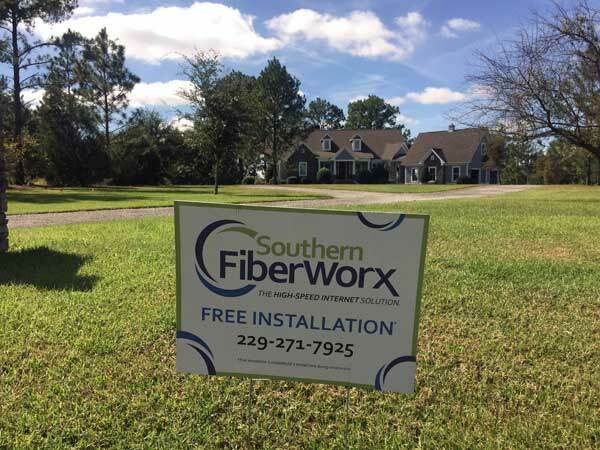 What you can do - whether you are a contractor/installer, distributor or manufacturer - is to politely inform your customers that it takes skill and experience to successfully build a fiber optic network. That using trained and certified workers will help ensure the investment they are making in their network will have a proper payback. Quite a few of our instructors have been told by employers "If I pay to train my workers they will leave for higher paying jobs." One of our instructors replies, "If you don't train them, will they stay and continue to do substandard work for you?" Check out the bumper sticker above seen recently on a contractor's pickup truck! 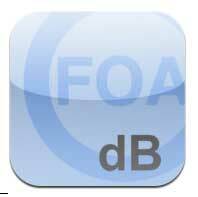 FOA schools are seeing increasing numbers of students and FOA is certifying techs at much higher rates that before. They are also offering a larger variety of courses. 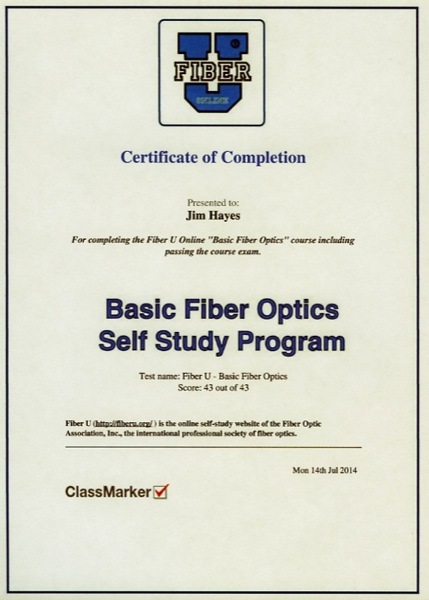 Our online Fiber U certificate of completion programs are growing also, especially in the applications areas. But we still have a long way to go. FOA is doing extensive research on this problem. Watch for more discussion on this topic in the next few months. Got comments? Contact FOA with your feedback. Many of the problems we're seeing and hearing about are caused by cost cutting. Surely you have heard the quote attributed to an American astronaut* asked what he was thinking about sitting on top of a rocket ready for launch: "I realized I was sitting on a machine with a million parts all built by the lowest bidder." Is that how you feel about your cable plant project? Misleading Headline Award: "Google Fiber wins faster access to utility poles over AT&T’s objections"
Any number of tech websites had similar headlines recently, this one from arstechnica. Why is it misleading? Let's start with the subheading on the article: "AT&T likely to sue Nashville over rule providing quick access to utility poles." That's just the beginning. The Nashville Metro Council has to vote one more time on this resolution called "One Touch Make Ready" to give Google Fiber faster access to utility poles, approving an ordinance opposed by AT&T and Comcast. The One Touch Make Ready ordinance (what this means) would let a contractor for a single company—such as Google Fiber—make all of the necessary wire adjustments on a utility pole itself without having to wait for incumbent providers to send construction crews. This has been a major slowdown for Google FIber in Nashville where "Of the 88,000 poles we need to attach Google Fiber to throughout Nashville, over 44,000 will require make ready work," Google Fiber had said. Nearly 9,800 poles have been "approved" for make ready work, "but so far, only 33 poles have been made ready." This is just another skirmish in the "Pole Wars" we reported on in last month's FOA Newsletter. Here is another article from the Nashville Tennessean that has more details about this issue. It includes an interesting quote: "AT&T insists it has not slow-walked anything, that it has efficiently handled applications for pole attachments. It’s a complicated process — in fact, not nearly as simple as the name of the “one touch” bill title implies." Last moth in the FOA Newsletter, we discussed the way incumbents have been taking their points of view to the courts. They have also been going to state legislators who are happy to pass pro-incumbert legislation since the incumbents are big campaign contributors. That led to 19 US states passing legislation written by telecom lobbyists that would prevent broadband networks owned by municipalities or public-owned utilities. Obviously this was aimed to stop more cities from building systems like the highly successful systems in Chattanooga, Clarksville, Morristown and Bristol, Tennessee. Here are the details of these individual state laws. In the February 2015 FCC judgement on network neutrality, the "Open Internet Order of 2015," FCC adopted strong rules on net neutrality and specifically negated the state laws in Tennessee and North Carolina based on petitions from Chattanooga, TN and Wilson, NC. Chattanooga and Wilson argued that these state laws are in conflict with the FCC’s federal mandate to promote broadband deployment throughout the country. The commission agreed, and in doing so handed consumers another victory. The assumption was that this would be reason to negate laws in the other 19 states. Almost immediately, the states of Tennessee and North Carolina sued the FCC, and it did not take long before they found a friendly judge who overturned the FCC ruling. If you want the details, see Court Overturns FCC Effort To Promote Municipal Broadband Competition. That threatens the 10G network planned by Chattanooga's EPB and Wilson's Greenlight fiber netwwork. Regulators will “consider all our legal and policy options,” he says. Several times in the last year we've reported on the sale of broadband or CATV systems, specifically looking at the price paid for a subscriber. It has been consistently in the %$5000 range. This is important information for those independently developing broadband or FTTH networks as it provides a benchmark value for their investment. Two more systems were recently sold. Private equity fund TPG Capital says it has reached agreements to acquire regional broadband services providers RCN Telecom Services LLC and Grande Communications Networks LLC. TPG will buy the companies in separate transactions from their common owner, ABRY Partners. RCN will cost $1.6 billion while Grande's price tag will be $650 million. Those numbers are higher than most recent sales and indicate that the value of broadband customers is being recognized by the financial community. Remember in the March FOA Newsletter we talked about the SmartGig LA meeting we attended? And in the June FOA Newsletter, we talked about the meeting the same group ran in the Bay Area. Why Columbus? Columbus has been selected as the winner of the $40 million Smart Cities grant from the U.S. Department of Transportation. In addition, Vulcan Inc. has contributed another $10 million to incorporate electric vehicle infrastructure. SmartGigCities has planned a number of other meetings around the US. Sign up here for the SmartGig Cities newsletter to keep up to date on their future programs. How Much Do Installers Make In The Various Regions Of America? The map below, from a US Department of Labor, Bureau of Labor Statistics web page of data on "line installers" which includes fiber optics, shows the distribution of wages in the US. 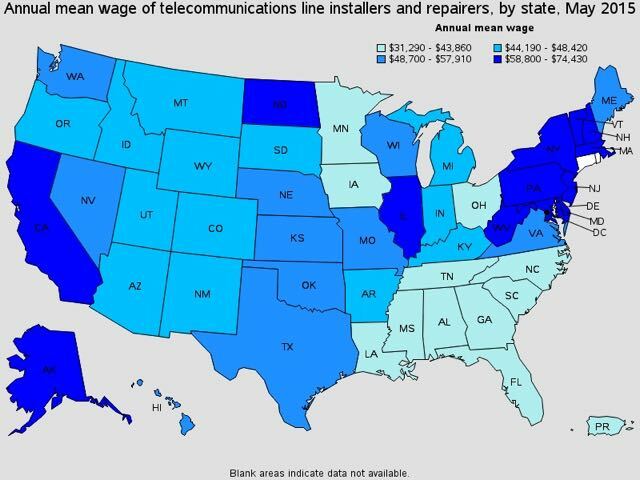 This map includes all telecom line installers which includes both copper and fiber, but it gives good relative data to where wages are higher and lower. So if you are looking for work or hiring workers, this information will be helpful. The web page also includes maps of numbers of workers by industry and other relevant analyses from data available in May 2015. It's very interesting reading. Go here to read the entire page. The new sports facility built for the Sacramento Kings NBA team claims to be the highest tech stadium in sports. That's a big claim! In recent times, the FOA Newsletter has profiled the 49ers new Levi's Stadium in Santa Clara and the 1000 wireless DAS antennas in the Nissan Stadium for the Titans in Nashville. But there may be some truth in the claim from Sacramento. It helps to know that Qualcomm (the wireless chip company) chairman Paul Jacobs is an investor in the team, and that Kings owner Vivek Ranadive made his fortune in software, both quintessential techies! The Golden 1 Center is much smaller than the big football stadiums - under 20,000 seats - but is truly a high-tech wonder - so much so that it was written up in a Wired Magazine article recently. If you want all the details, we suggest you read that, but here is the summary - a 84-foot 4K video board, an ultra-interactive app for fans to use during events, and a massive amount of connectivity within the building. At a command center, a group of employees check a bank of ~20 screens to see everything that’s happening. There is a 6,000 square foot data center and hundreds of WiFi (802.11ac) and small cell wireless antennas. To create this high-tech wonder, there are over 900 miles of fiber (mostly SM but some new Commscope wideband MM fiber) and 300 miles of copper. Of course this is just another example of why the FOA has created education programs covering applications like OLANs, data centers and DAS and has free online courses at Fiber U to allow anyone to learn more about these state-of-the-art applications. Maxcell has been a pioneer in the field of fabric innerduct to expand capacity of typical fiber ducts by replacing rigid plastic innerduct with flat fiber innerduct. 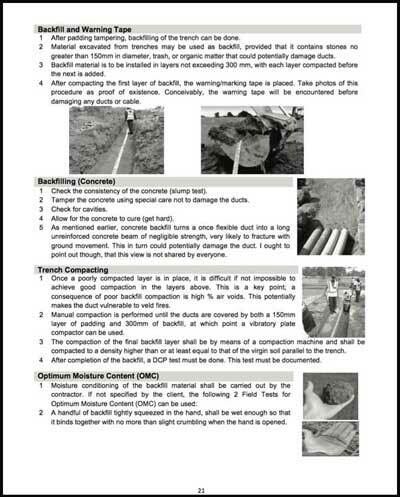 (See FOA Newsletter July 2014) Now they have a method of removing current innerducts without disturbing the live cables in them and adding fabric innerducts to double or triple the capacity of the conduit. They have special gear to pull out the current ducts leaving the cable in place and split the duct to remove it from the cable and prepare it for chipping for recycling. After all the old rigid innerduct is removed, you can pull additional cables into the fabric ducts immediately. The advantages are obvious - getting space for additional cables without installing more conduit - no more construction, no additional cost beyond the simple - and quick - process of removing the old innerduct and pulling in the new. Watch the Maxcell video on YouTube here. We all know the problems with dirty connectors but keeping connectors clean, even after just cleaning them, can be a problem. The Microcare Sticklers people have been talking about the problem of static electricity for some time. When you clean a connector with a dry cleaner, you may cause a static charge on the connector ferrule that will attract more dirt from the air. Sticklers solution is a cleaning fluid that is conductive and prevents static. Used with their cleaning tools, it reduces the static problem and helps ensure clean connectors. Watch their video here. The Microcare Sticklers people tell us they working on a series of five training videos about how to clean various connectors by application and should have the videos done by the end of September. We'll update you on those next month. Intel is reportedly making volume shipments of 100G transceivers for data centers using their "silicon photonics" processes. Intel has been working on this for a long time, FOA has covered their efforts for more than 5 years, most recently in the FOA Newsletter in September 2013. Silicon photonics integrates the laser and photodetector with the chips needed for drivers and signal conditioning, greatly simplifying packaging and potentially lowering cost. The first two products are singlemode 100G transceivers with either parallel optics (4X25G) with either pigtails or MPO ports (left photo) or WDM on two fibers for LC connectors (right photo). Both devices feature low power consumption - 3.5W - a very important spec for data center products. Read more about the Intel products here. In an interview on the CIO magazine website, Diane Bryant, executive vice president and general manager of Intel's Data Center Group, said the silicon photonics components will initially allow for optical communications between servers and data centers, stretching over long distances (~2km). Over time, Intel will put optical communications at the chip level. Jason Waxman, corporate vice president and general manager of Intel's Data Center Solutions Group, noted fiber optic cables will take up less space than older cables, and depending on the workload and implementation of servers, fiber optics can also be cheaper than copper cabling. "I came across a site that has alleviated my frustrations and has proven to be rather accurate for my own purposes. The site, courtsystem.org seems to have a complete database of listings for all emergency, legal and law enforcement government offices in the country – with working phone numbers (at least for the ones I’ve tried!). I wanted to share the site because it has saved me a few headaches and I’m sure it would be useful to others as well." 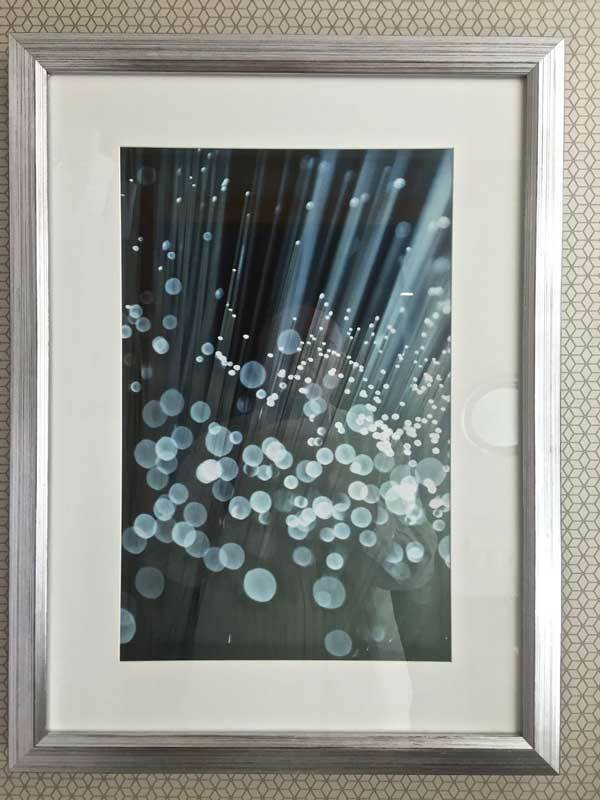 Fiber optics has often been used in art and many beautiful photos of fiber optics have been created. 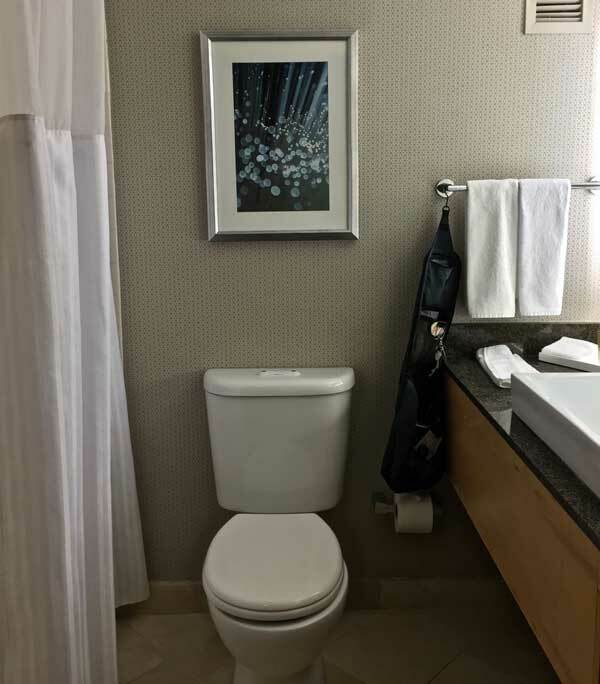 When we checked into our hotel for the SmartGigCities Bay Area meeting, we found this great photo on the wall. But we did find it humorous! FOA participated in its 20th consecutive IBEW/JATC National Training Institute this summer in Ann Arbor Michigan. FOA has been a supporter of the IBEW NJATC (now called the "electrical Training Alliance") summer train-the-trainer program for two decades. This summer FOA Director and Master Instructor Tom Collins taught a pre-NTI CFOT course and a TTT course during NTI. FOA's Jim and Karen Hayes did an evening program on the FOA Design Certification and answered questions about the FOA. Attendance this year was very high, indicating a high interest in fiber optics by electrical contractors. 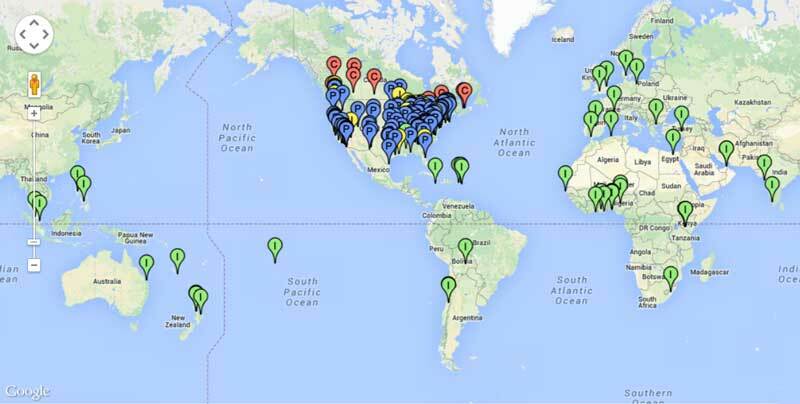 FOA has over 30 local JATCs in the US and Canada teaching the FOA curriculum and offering FOA certification. At the Ann Arbor NTI, we signed up a number of new locations also. In last month's newsletter we discussed the Open Compute Project's (OCP) amazing results at cutting costs of singlemode transceivers for data centers. (See How To Get Fiber Optic Transceiver Costs To Drop 90%). This article led to several discussions on the way data centers are being built and how standards are being developed, specifically the move to singlemode fiber to allow equipment upgrades without cabling changes and "open-sourcing" the design of electronics. OCP is a user group started because traditional vendors were not delivering the solutions needed. Traditional server/switch vendors were not delivering products with the performance/price needs of users in mind. Standards for data center cabling were not based on the realities of the business. In this case, the "realities" of the business was that technology was allowing - no requiring - upgrades to the data center every 18-24 months, way too fast for traditional switch/server manufacturer product upgrades and the typical 5-year cycle of standards development. One could also say that OCP is another example of the "disruptor model" of current businesses - take a completely new look at how to run a business and ignore the past models - which has become the usual method of operation for current business startups. That this model can work for OCP has shown that it is a valid model for developing standards - in fact it may prove to be a better method. When products reach commodity status - like data center servers and switches and their fiber optic transceivers - the input of real customers is absolutely necessary to get the product designed right. And real customers are rare in the regular standards committees. Now Facebook and its partners are taking the same process to wireless and long haul backbones. Below are overviews of the projects and links to learn more about them. Will they have a similar effect on these aspects of the communications business? "As of the end of 2015, more than 4 billion people were still not connected to the internet, and 10 percent of the world's population were living outside the range of cellular connectivity. Despite the widespread global adoption of mobile phones over the last 20 years, the cellular infrastructure required to support basic connectivity and more advanced capabilities like broadband is still unavailable or unaffordable in many parts of the world. At Facebook, we want to help solve this problem, and we are pursuing multiple approaches aimed at improving connectivity infrastructure and lowering the cost of deploying and operating that infrastructure. Today (6 July 2016) we are announcing the OpenCellular access platform, and over time, we will be open-sourcing the design. We will also work on other elements like the software management system, hardware design, baseband, amplifier, filter, mounting device, and antennas. We have implemented an access platform that can support a wide variety of wireless network standards, from 2G and LTE to Wi-Fi access points. Anyone can customize the platform to meet their connectivity needs and set up the network of their choosing, in both rural and urban areas. For instance, the system, due to its on-board computing and storage capacity, can be configured as network-in-a-box or purely as a cellular access point." Could this affect wireless as much as OCP has affected the data center? Time will tell. Read Facebook's announcement of OpenCellular here. "As this OCP work was happening, we recognized that telecom infrastructure could benefit from the same innovations taking place in the data center. The power of CPUs and fiber optic network technology has skyrocketed while simultaneously growing significantly cheaper, and it was clear that the raw building blocks of what we were developing for our own infrastructure could be applied to telecom networks with great benefit. That’s why we’ve co-founded the Telecom Infra Project (TIP). TIP is bringing together operators, infrastructure providers, system integrators, and other industry players to work together to develop new technologies and rethink approaches to deploying network architecture that leverage these new advances in the technology and an open approach to development. We are thrilled to launch TIP with Intel and Nokia, which have been delivering industry-leading technology solutions for a very long time, and Deutsche Telekom and SK Telecom, which have both demonstrated significant leadership in the development of new network technologies. A number of other technology partners have also joined TIP and will provide knowledge and operational expertise across all areas of the telecom stack, driving innovation right from the start. At first, TIP will focus on disaggregating the components of network infrastructure that are traditionally bundled together and vendor-specific. This will give operators more flexibility in how they build out their networks and enable better, more cost-effective coverage. TIP members will work across three areas — access, backhaul, and core and management — to explore new hardware and software architectures with an eye toward greater simplicity and efficiency." We'll follow this development carefully as it is, like the other open source projects, potentially a major factor in the development of the fiber optic industry. After years of training and working with fiber optic professionals, I have learned that a few practices can help teams to be more effective at implementing and maintaining their optical networks. Many of these require little effort, and can make significant improvements in the quality and performance of your network. Some of these practices will help to keep you safe and be more effective at the job, while promoting professionalism and high standards among fiber professionals. I find that some of these practices might have greater impact than others, which is why I consider the following ones to be "commandments for fiber optic professionals". The number one cause of fiber optic network problems is dirty connectors. Dirt can cause problems like damage to a connector’s end face, misalignment, and attenuation. 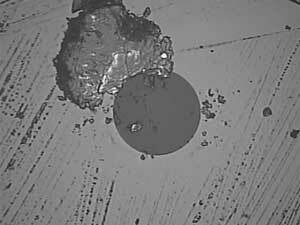 Grease, like the one from your fingers, can cause future problems in networks as high output lasers can end up burning it, causing charring and clouding to connector end faces. Make sure to inspect all connectors before plugging them in. 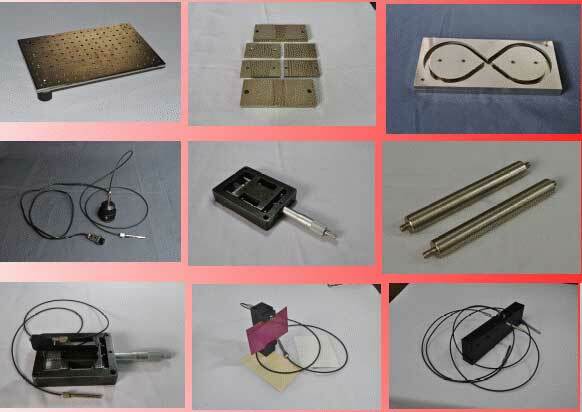 Whenever possible, include an end face inspection probe image for each connector with your test and characterization records. Protect your eyes by testing with a power meter for verifying that fibers are not active before testing with microscopes. The number one cause of injuries when working with fibers are mishandled fiber scraps. 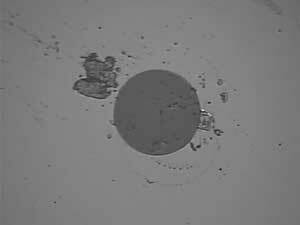 Those tiny fragments of glass will find the way into your skin and clothes if you are not careful. Even worse, if you don’t catch these in time and do something like touching your eyes, you could end up inflicting a potentially painful eye wound to yourself. Protect yourselves by always wearing safety glasses. You could also take fiber scraps home with you if these are on your clothes, so make sure to get them all and dispose properly. Use appropriate sharps dispensing containers, handle and collect with tweezers or black electrical tape, and dispose of appropriately. Working on black surfaces will help you spot these fragments more easily due to the color contrast. Your fusion splicer is akin to a soldier’s rifle. Without a good working splicing-set is hard to be effective in the field. The last thing that you want is that after spending days on a job, finding high attenuations and bad splices due to faulty equipment. Safeguard and protect your splice-set from bumps, dirt, and humidity. Keep it clean, dry, and isolated from dust. Frequently clean the v-grooves with non abrasive materials or tools. Clean the electrodes and change them as needed, according to manufacturer recommendations. Keep the batteries charged. Avoid connecting directly to power plants and use power conditioners to protect from current peaks that could potentially damage circuit boards; instead, opt for using the equipment battery whenever possible. Today, there are many tools and gadgets for making field work easier and safer. Avoid losing your hands to a poorly handled box cutter. Instead, use appropriate cable prep tools. There are arrays of specialized tools for tasks like prepping mid-entries, distribution breakouts, opening flat drop cables, etc., which could save you time, keep you safe, and protect the fibers (and your fingers). I have seen, more than once, punctured or cut loose tubes, cut fibers, and damaged cables due to technicians not using appropriate tools, or simply preferring to use their pocket knives. Use the best quality cleavers available to ensure good splices and connections. While there are excellent options in the market today, I happen to like Jonard Tools, not only for how practical they are, but also for how affordable. I see many guys using VFLs for checking short distance links. That is not the right practice. Every link, regardless of its length, should be tested with an OLTS for optical loss/attenuation. 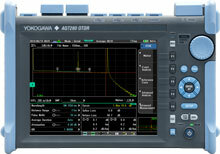 When verifying continuity, identifying fibers, checking polarity, or looking for faults close to the source you can use VFLs, and when checking for distance, specific events such as splices, and when troubleshooting, you can use an OTDR; nevertheless, when conducting acceptance tests, for any link of any type, use a light source and power meter for verifying that the cable plant is working within specified optical budgets. 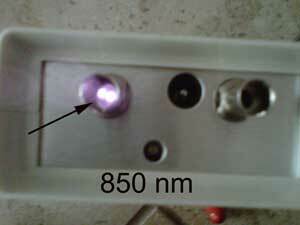 This will ensure that your optical equipment will have a clean and useful optical path. VFLs are a good start, but do not tell you the appropriate information you need for link verification. Nothing as bad than completing an installation and not finding your fiber paths as expected, due to wrong fiber mapping and crossed splices. In order to avoid this, network design and planning documentation must be developed accurately and shared effectively from the start. After installation, appropriate “as built” documentation must be created, shared, and applied in order to maintain accurate records. These will be your best friends when conducting maintenance operations, such as troubleshooting and restoration. You will be surprised of how much there is to know about designing, installing, and maintaining optimal fiber networks. Often some take the time for learning once they find that their networks do not work. Appropriate network design and planning are foundational in implementing fast, future proof, and reliable networks that help in gaining and maintaining happy customers, securing your company’s investment, and keeping your job. The present technological advancements in STEM (science, technology, engineering and math) education have evolved through research on basic experimentations. Optical fibers applications are no exceptions. 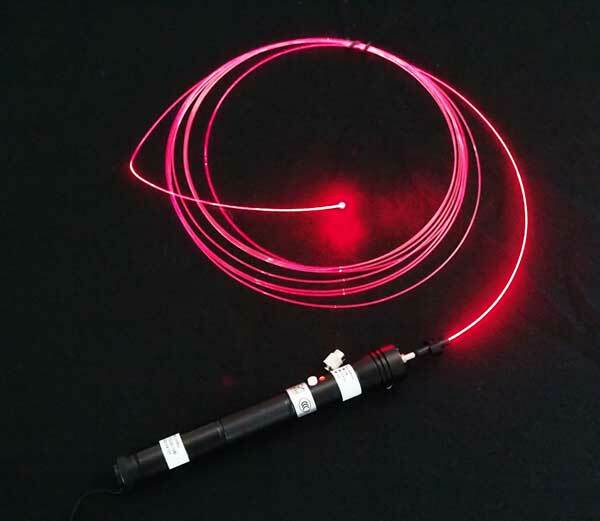 RUBY OPTO SYSTEMS in India has developed a series of educational apparatus to help demonstrate fiber technology and help students understand the theoretical and experimental aspects of optical fiber technology and optical fiber sensor applications. The design of experiments comprises of losses or attenuation due to bending (total internal reflection), misalignments (through beam) and sensing (reflective beam) apart from losses due to optical fiber end preparation, optical fiber lengths, source and detector coupling and the numerical aperture of an optical fiber. The optomechanical components are ergonomically designed for the purpose of hands-on experience. The methodical procedure of conducting the sequence of experiments substantiate towards the understanding of basic principles and further basic computation of power budgeting, the fundamental criteria of an optical fiber network. The seamless integration of modules/ components based on the design of the experiment make s it versatile and not a mere plug and play monotonous activity. Two New Books From FOA - Not Just For Installers - Their Bosses Need To Read Them Too! These books should be on the bookshelves of network owners or managers, facilities managers, supervisors of the installers and anyone else involved with fiber optic networks. 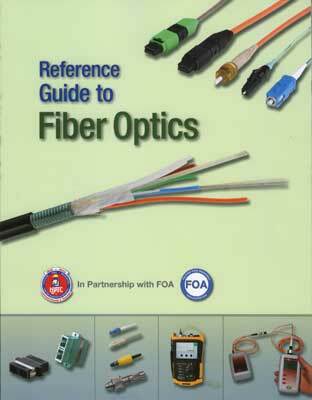 FOA has published two new books that provide useful information for those involved in fiber optic projects, and not just for installers. 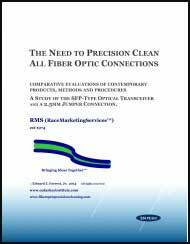 The latest, the FOA Reference Guide To Fiber Optic Network Design, is a comprehensive guide to designing fiber optic networks of any type, from concept to completion. This book looks at design from the initial need for communications through the process of setting the route of the cable plant, choosing components, finding a contractor, planning the installation and documenting the process from beginning to end. While one might think the focus of the design book is on the person actually designing the network, it is also aimed at those for whom the network is being designed - the network owner or manager, facilities manager, supervisors of the installers and anyone else involved in the process. 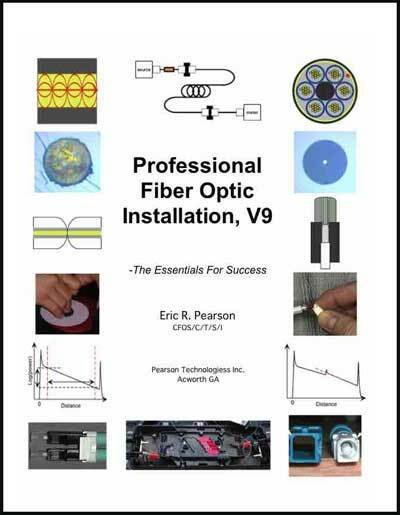 We especially think that everyone who contracts for fiber optic installations should have a copy of this book on their bookshelf as a reference for when they are involved in a project. The second book which we released recently, the Outside Plant Construction Guide, is another book aimed at a wider audience than installers. 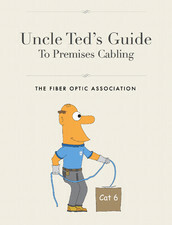 Certainly it's of interest to installers, being the only book we know about the actual construction process of installing fiber optic cables, but it is also useful to the designer of the network and those who contract for fiber optic cable plant installation, especially if they are involved in getting permits and easements or having to explain to others the process of installation. Both books, like all FOA books, are inexpensive and available in paperback or Kindle formats. FOA has just published a new textbook, the FOA Reference Guide To Fiber Optic Network Design, a complete guide to designing fiber optic networks, OSP and premises, for the contractor, installer, designer, project manager, facilities manager and user. The book covers all aspects of a fiber optic project from the initial need for the network through the construction phase. It includes checklists for designers and project managers, appendices on estimating and standardized project management and guides to case studies. About all that's missing is CAD and GIS which we leave to those involved in the software to provide the details on those. 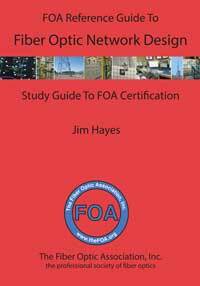 The FOA Reference Guide To Fiber Optic Network Design is now the textbook for the FOA CFOS/D certification courses and a reference for those taking the free online course about Design on Fiber U. The curriculum for the CFOS/D courses has been updated also with new material and an introduction to fiber optic technology to make the course appropriate for a larger audience - not just CFOTs but network owners and managers, facilities managers, planners, estimators, supervisors, etc. The book is available direct from the FOA eStore or Amazon.com where it is also available for Kindle, local booksellers and other distributors. 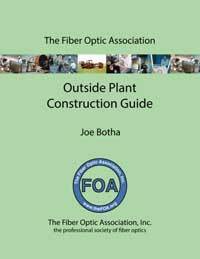 The FOA has published a new textbook on outside plant (OSP) fiber optic construction. The book covers topics which are rare in fiber optic textbooks - practical solutions to designing and installing the fiber optic cable plant in an OSP environment. 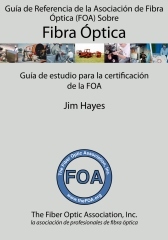 It is an extremely valuable reference book for all owners, designers, supervisors and installers of fiber optic OSP networks. 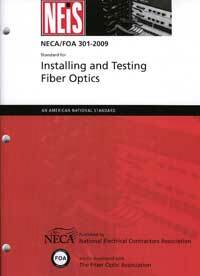 This textbook is a complete guide to outside plant fiber optic construction, covering the process of installing the fiber optic cable plant starting with the construction work necessary for installation of both aerial and underground cables before the fiber optic techs begin splicing, terminating and testing. 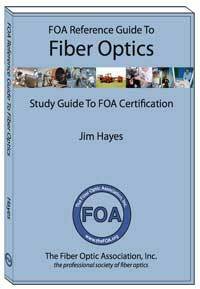 It is intended as a companion to the FOA Reference Guide To Outside Plant Fiber Optics and for use in FOA OSP specialist certification classes. 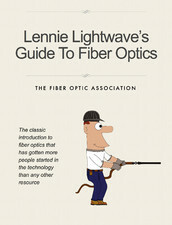 It's also an excellent reference book for anyone designing or installing fiber optic networks - even the owners of those networks. This book was created by Joe Botha of Triple Play Fibre Optic Solutions in South Africa as a textbook for classes he teaches on OSP construction. 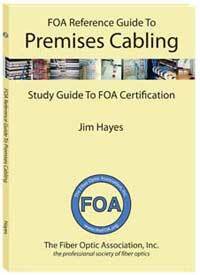 Joe, an FOA Master Instructor, created the course to fill a need for training OSP construction crews and agreed to share this useful book with the FOA and the fiber industry. 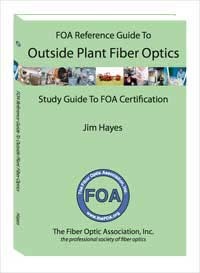 The FOA Outside Plant Fiber Optics Construction Guide is available from Amazon books for $14.95 in paperback or $7.95 on the Kindle. 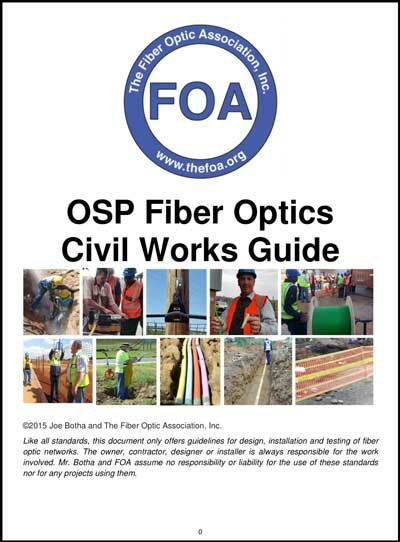 You can download a free PDF copy of the FOA OSP Fiber Optics Civil Works Guide by Joe Botha here. You can also purchase a printed copy. Here are details. Why Columbus? Columbus has been selected as the winner of the $40 million Smart Cities grant from the U.S. Department of Transportation! In addition, Vulcan Inc. has contributed another $10 million to incorporate electric vehicle infrastructure. Contractors And Installers Take Note - YOU Should Be There Too! How Long Does It Take To Transfer Data Over Fiber? Q: Have there been any studies that show how long it takes for data to travel over a fiber cable where the point of origin is 500 miles away vs. a point of origin that is 5000 miles away? 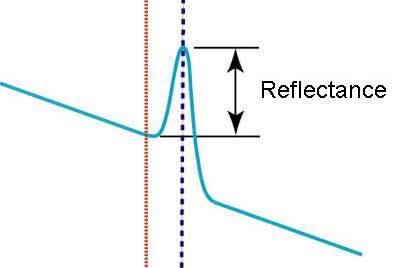 Light in a glass fiber travels at the speed of light (c=299 792 458 meters/s) divided by the index of refraction of the glass (1.4677 @ 1310nm, 1.4682 @ 1550nm). For long distances, 1550nm is used, so the speed of light in the fiber is about 204,190,476 m/s - “about” because of some secondary factors, so let’s say 204,000 km/s. That’s about 4.9 ns/km or 4.90 ms/1000km from point A to point B. 2. Then the speed will depend on the data speed of the network. Obviously a system at 1Gb/s will take ~10 times longer to transmit a packet of data than a system at 10Gb/s and ~100 times longer than a 100G system. This speed also depends on the protocol of transmission which determines the overhead of transmission. Thus a 1000 byte packet has 8,000 bits and will equal about 10,000 bits with overhead. To transmit a 1MB file, it requires 1000 packets and will take ~10Mbits of data, equalling 10milliseconds at 1Gb/s, 1millisecond at 10Gb/s, and 0.01 ms (10microsec) at 100Gb/s. 3. Processing time in transceivers and multiplexers. Data is usually processed in parallel but transmitted in serial. The conversion takes some time. 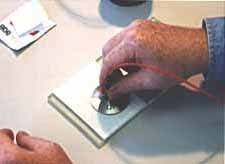 Some transceivers also do some pulse shaping which may take time. Then there are transit times to get parallel data transmitted throught amps, lasers, (then the fiber link) to a detector and amps and demultiplexers on the other side. Q: I’m looking for an inexpensive, but reliable method to quickly and easily identify terminated and unterminated SM and MM fiber, perhaps something similar to a tone and probe used for copper cabling. For example, I found a unterminated coiled fiber cable and would like to use it, but there are several unlabeled, terminated and unterminated fiber cables at the other end. Is there an inexpensive universal tool to simply and easily find the cable/s I’m looking for? A: Your best bet is a visual fault locator (VFL) but you do not need a bare fiber adapter, just a unterminated connector. 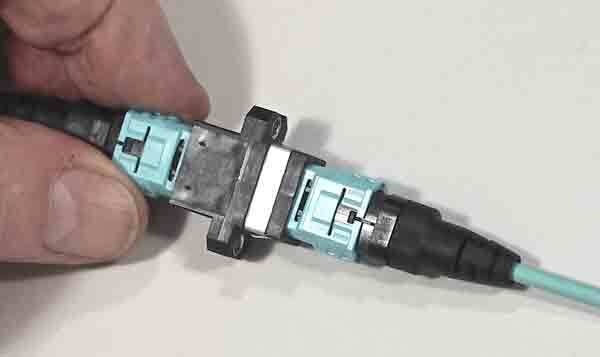 You will need to strip the fiber and preferably cleave it, but that can be done off the end of the connector. Just scribe the fiber and pull straight away from the connector. That should give a cleave good enough for using a VFL to trace fibers. Q: Can a switch or SFP module specified at 1310nm GBIC connect to another switch or SFP that has is specified at 1300nm GBIC? A: No problem - there is no material difference in 1300nm and 1310nm - it's just jargon. 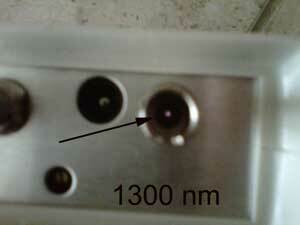 The 1300/1310nm confusion has been part of fiber optics for 30 years. Basically, there is no real difference in the wavelengths except for traditional nomenclature. The nomenclature evolved to this - if you said 1310nm, it was assumed you were talking about lasers, but if you said 1300nm, it was assumed you meant a LED! Q: Is there a standard color code for the jacketing of a hybrid all optical cable, one that has both single mode and multimode optical fibers in it? A: No, it has to be spelled out on the cable. We could use a standard however. We know plenty of people who got SM and MM confused in a hybrid cable. Q: In a fibre system using separate cables for receive and transmit, do the cables need to be the same length. Do the patch leads need to be the same length? A: The answer is “no” within reason. Duplex signals are asynchronous by design so a small difference should not cause problems. For some protocols, very large differences might be a problem, but certainly not the small differences in fibers in a cable or patch cord variations. 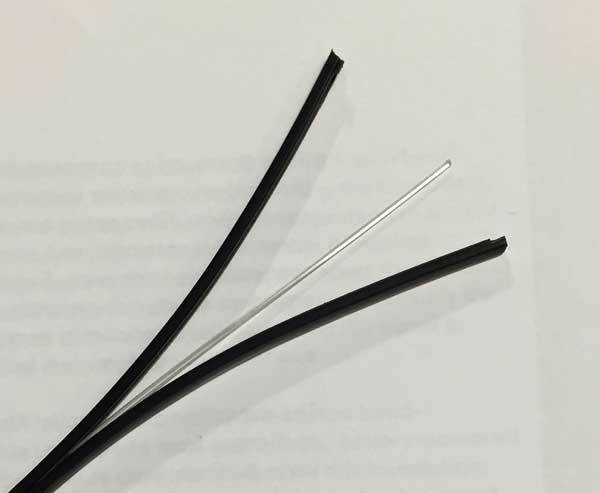 Even in a long OSP loose tube cable, there are variations in the length of fibers, as much as +/-1%, because the fibers are loose in the cable to prevent stress, so at 100km, the difference could be significant. Networks allow for this. Q: Can I splice OS2 pigtails to OS1 fiber? There is no problem mixing them in a system because other than the reduction of the water peaks, the fibers are the same and can be joined with no excess loss. 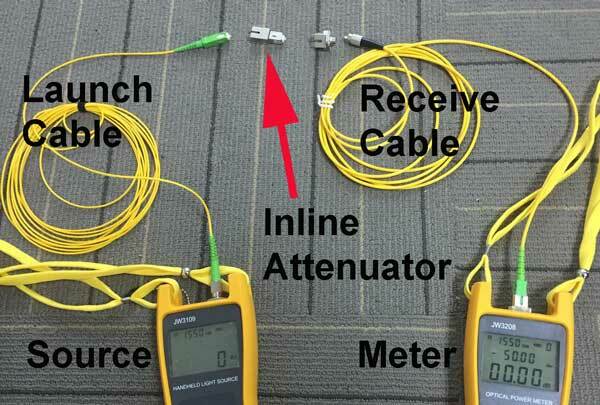 Q: How do I test an inline attenuator (receptacle on one end and connector on the other)? First measure the output of the source with a cable as the “0dB” reference. Use at least a 2m cable and put a 50mm loop in the cable. Remember you need SC/APC connectors on the cables mating to the attenuator. Attach the receptacle end of the attenuator to the cable, then use a mating adapter to attach a second cable to the attenuator. Attach the meter to the end of the second cable to measure the loss. Be sure to put the loop into the cable attached to the source. Be sure your two cables are low loss and everything is very clean. Q: I inherited some old fiber to characterize. How do I set the IOR in the OTDR? A: The index of refraction is the spec the OTDR uses to calculate length. If you refer to the data sheets of fiber manufacturers like Corning (https://www.corning.com/media/worldwide/coc/documents/PI1463_07-14_English.pdf) and Prysmian (http://www.prysmiangroup.com/en/business_markets/markets/fibre/downloads/datasheets/SMF---Enhanced-Single-Mode-Optical-Fiber-ESMF.pdf) you will find that G.652 fiber has similar index of refraction among most manufacturers - 1.467 @1310nm, 1.468 at 1550/1625nm. If you do not know what the index of refraction is, using those is probably a very good estimate. Remember the measured length of fiber will be ~1% longer than the cable and you may have ~1% uncertainty in the instrument measuring length. Q: If a connector is designed for heat cure epoxy adhesive, can I substitute anaerobic adhesive? A: Any ceramic ferrule connector can be used with either heat-cure epoxy or anaerobic adhesives. Q: I have been given a job that will require me to cut an existing 6 count cable in two and splice in a new piece. My problem is that this cable was installed in 1987. From what I have been told there is a good possibility that this cable does not follow present day color codes. Rumor has it that this cable has 3 pairs of Red/White fibers. I was wondering if those pairs are separated by a string or what? Otherwise I will be guessing as to what fiber I am working on. Any information you have on this old fiber type would be greatly appreciated. A: Color coding for optical cables is unpredictable except for the 1-12 color codes adopted from electrical standards. 1. If the renter buys an Ethernet switch, can this switch be directly pugged onto POL’s fiber terminals? 2. Or this L2 should be plugged onto ONT of POL? A: If I understand the question correctly, you are asking if you can connect a L2 switch with an Ethernet port directly to a OLT. If the OLT uses GPON and does not have Ethernet ports, the answer should be no, GPON and Ethernet are not compatible so the Ethernet switches should be connected to the Ethernet ports on the ONT. Q: I need a source for estimating the cost of fiber optic cable installations. Direct buried, in PVC pipe, Jetting into existing pipe, etc. If you are looking for a consultant to do the estimates, I suggest contacting a local contractor, distributor or consultant who can do estimates. Q: We will be pulling inside of an underground 2" plastic conduit a 144 Strand OSP corrugated armored (coated steel tape) fiber cable Corning 144EUC-T4101D20. The client is asking what we are going to pull along with the fiber to allow - if it is needed in the future- to locate the fiber. Does an additional cable (like tracer wire) need to be pulled if the fiber has already the coated steel tape ? A: It is very unusual to pull armored cable in conduit - that’s usually a direct-buried cable laid into trenches or plowed in. The heavy weight will make for a lot of friction and may create problems pulling the cable. The armor on the cable should be suitable for later cable location. It’s conductive and would be detectable with many locators. 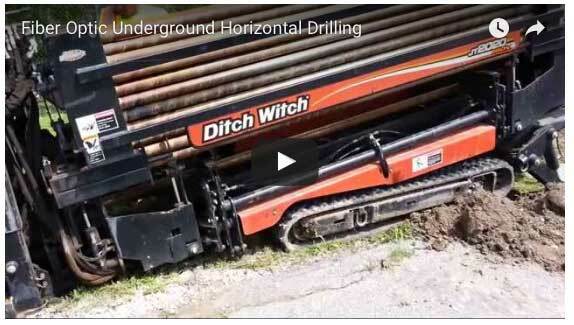 CI&M magazine has posted an interesting video about how Time Warner Cable installs underground fiber optic cable by directional boring. It's a good look at how directional boring works. Watch it here on CI&M's website. 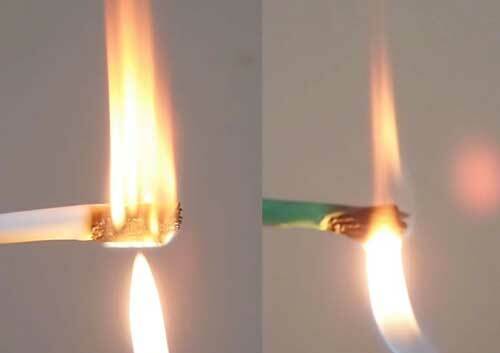 CI&M Editor also does a good review of alternative cable installation methods in an article on the magazine website. Read it here. A new 3M drop cable for FTTH has a 90 micron buffered fiber inside to allow more rugged terminations directly on the fiber. 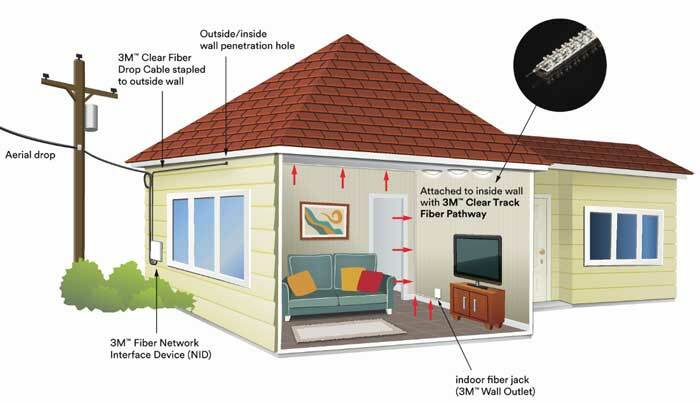 It's part of the "ClearTrack System" for easier FTTH installs. The FOA now has approved programs in place at 200+ organizations, welcoming new additions like the Joint Apprenticeship and Training Committee of the International Brotherhood of Electrical Workers, Corning Cable Systems and AFL and NASA's Goldstone Tracking Station. The complete list of FOA-Approved schools is at http://www.thefoa.org/foa_aprv.htm.